Death is all around us, but when it takes our friends it rattles us to our core. Such was the mood across the African continent when it was confirmed that Ethiopian Airlines flight ET302 had crashed six minutes after take-off. A total of 157 people died, passengers and crew from 35 countries. While investigations are ongoing to determine the cause, experts have noted that the Boeing 737-800 Max itself could have been the problem. Amidst the speculation, the fact remains that families have been lost, intellectuals have gone and the pain remains. 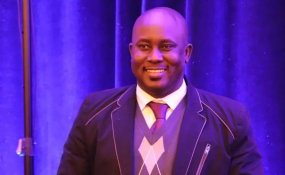 Nigerian writer and teacher Professor Pius Adesanmi, who travelled on a Canadian passport, was one of victims. Prof Adesanmi, the author of the award-winning Naija No Dey Carry Last, a satirical book that critiques the Nigerian socio-political space, was the Director of the Institute of African Studies at Carleton University in Canada. Prof Adesanmi's death stung; it still stings. I was with a friend celebrating his birthday when news of the disaster started trickling in. Officially there was only one Nigerian on the list of nationalities, but there were Nigerians on board who did not bear Nigerian passports. Then friends of Prof Adesanmi announced on social media that, indeed, he was on that ill-fated flight. We went into denial. Pius could not die! We'll wait for him to tweet, some said. That tweet would never come. Ake Arts and Book Festival was one of the spaces where I met the renowned intellectual. Many got to know him from his many posts on Facebook, filled with insight and acute analysis, dissecting the state of his beloved country. He drew many young Nigerians towards him. He was a father too, and his penultimate post on Facebook showed the love he had for his daughter, whom he had hoped to bring to Nigeria one day. The confirmation of the death of Prof Adesanmi would later come in droves on social media. Prof Adesanmi was meant to attend an African Union ECOSOCC committee meeting in Nairobi, Kenya. His final Facebook post was from Psalm 139: 9-10: "If I take the wings of the morning and dwell in the uttermost parts of the sea, even there your hand shall lead me, and your right hand shall hold me." "We have no real doubts or questions about the fact that he is dead. But we have doubts about the circumstances of his death. We can never speak of Ernesto Guevara in the past tense," Fidel Castro said when Che Guevara died. Prof Pius Adesanmi, an intellectual giant, is dead, but we can never speak of him in the past tense.